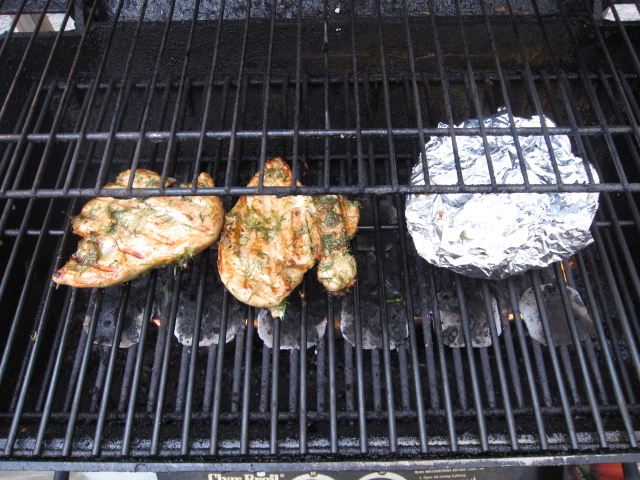 There are two seasons in my world…winter and grill! Grill season has just begun and I could not be a happier man for that. Well, I could, but this is certainly a happy moment. I actually opened up the grill a couple of weeks ago for a skirt steak, but the weather hasn’t been good enough to really start firing it up until this weekend. I know, some people think they’re more of a man because they grill in 30 below wind chills with 2 feet of snow on the ground. Personally, I think they’re morons! Every time they lift that lid they lose every bit of heat. All you do is end up with poorly cooked food. Not now though, the time is right for my clothes to smell like grill! We had an appt this afternoon so I only made two portions last night since we had no need for lunch. 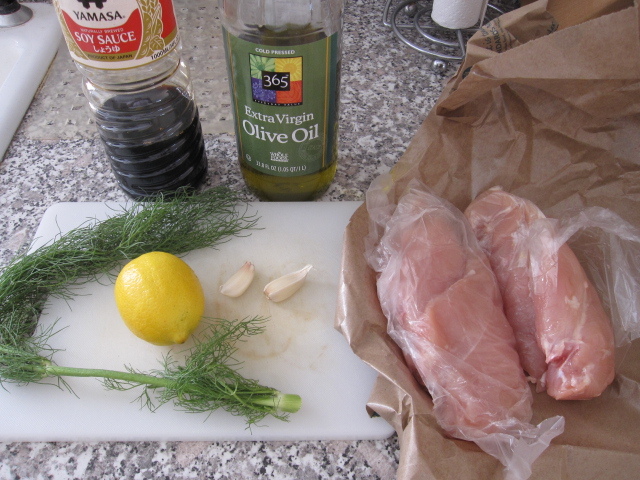 First thing I did was get the chicken marinating. I mixed together 1 fennel frond chopped up, the juice from 1/2 lemon, 2 garlic cloves minced, and 3 tablespoons each of soy sauce and olive oil. A few cracks of black pepper and then I rubbed it all over the chicken and let it marinate, covered, in the fridge for a couple of hours. 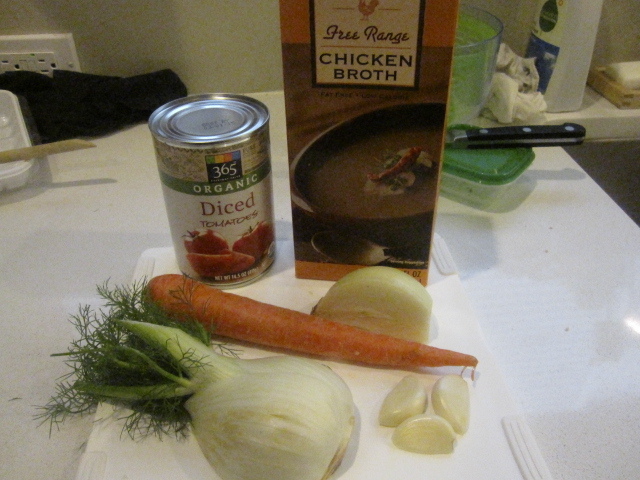 Then I got the soup ready. 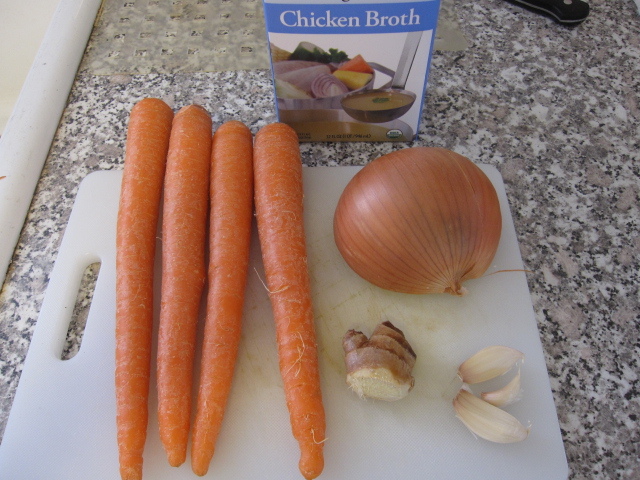 I put 4 carrots chopped, 1/2 onion chopped, 1 inch of ginger diced, 3 garlic cloves diced, and 1 cup of chicken stock into my pot. I brought it all up to a boil, covered the pot, turned the heat to med-low, and let it simmer for about 20 minutes. Then I turned off the heat and let it cool down for about a half hour. 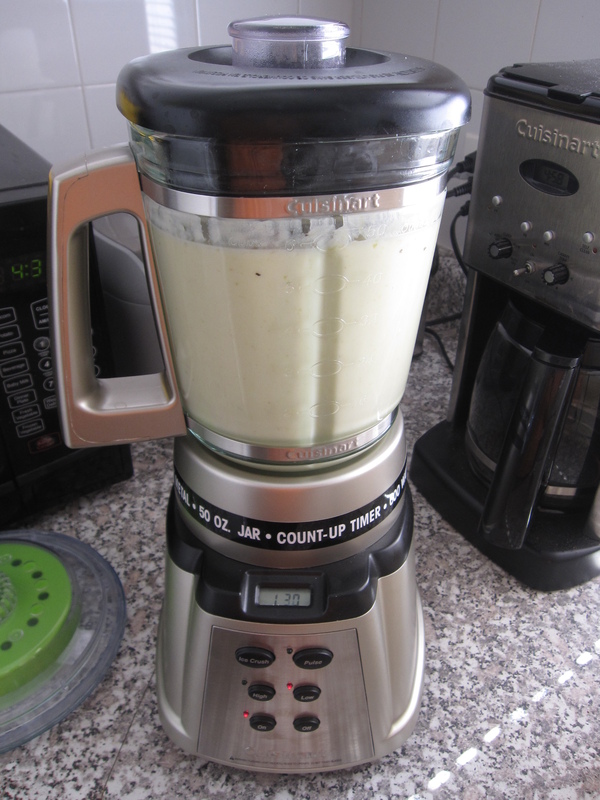 Once cooled, I poured it all into my blender and pureed it into a smooth soup. 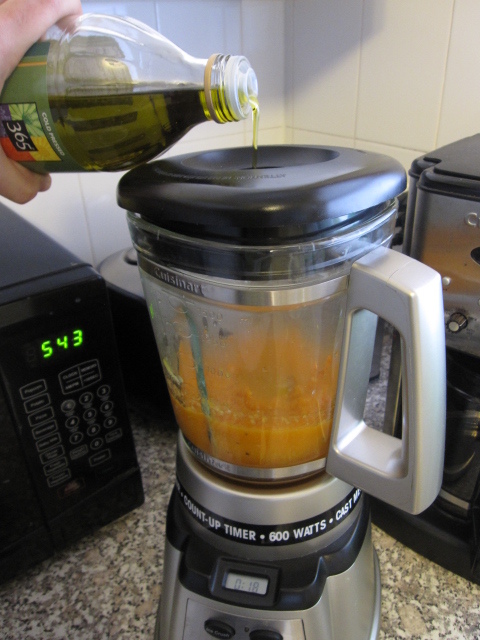 As it was blending I decided to pour in about 1/4 cup of olive oil to give it a silkier texture. Then I seasoned it with salt and pepper and set it aside. All I had to do to serve was simply heat it up again. 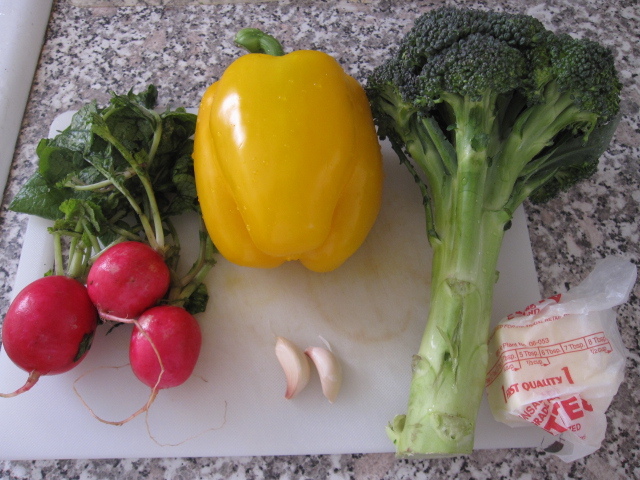 For my vegetables I used 3 radishes (I cut off the leaves) each cut into 6 wedges, 1/2 yellow bell pepper sliced with each slice halved, 2 garlic cloves diced, 1/2 head of broccoli cut into florets, and about 1/2 tablespoon of butter cut into little pats. 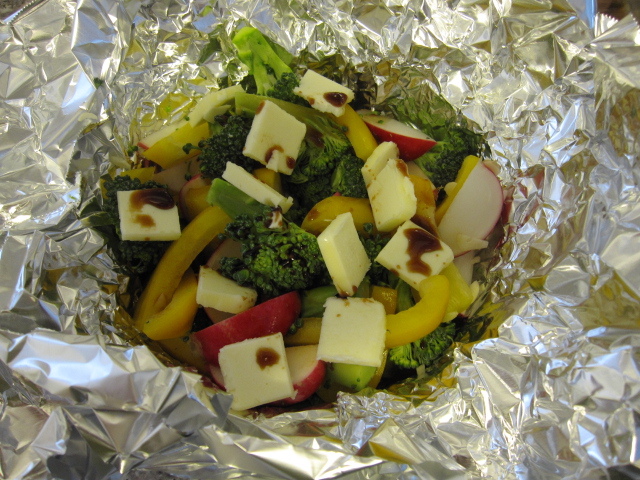 I mixed all of the veggies in some foil, laid the butter on top, sprinkled with a little soy sauce, and then closed it up. 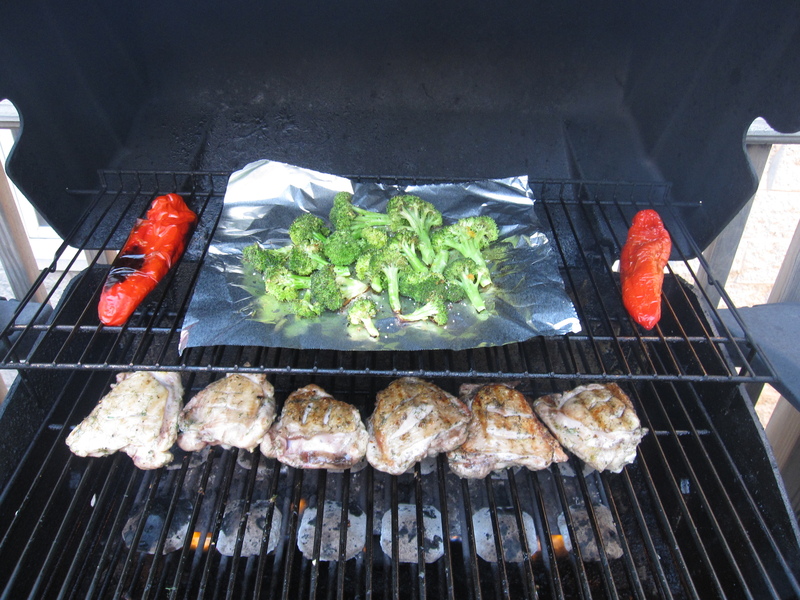 I fired up the grill at med-high heat and let the grates get nice and hot. I put the veggie packet on first and let them start to cook while I brought the chicken back to room temperature from the fridge. After about 15 minutes I put the chicken on. I cooked it for about 8 or 9 minutes on each side and that was all she wrote. Of course, each grill is different, so just make sure your chicken is firm when pressed so that you know it’s cooked through. Some white rice and a cold beer and Spring weather is officially here! 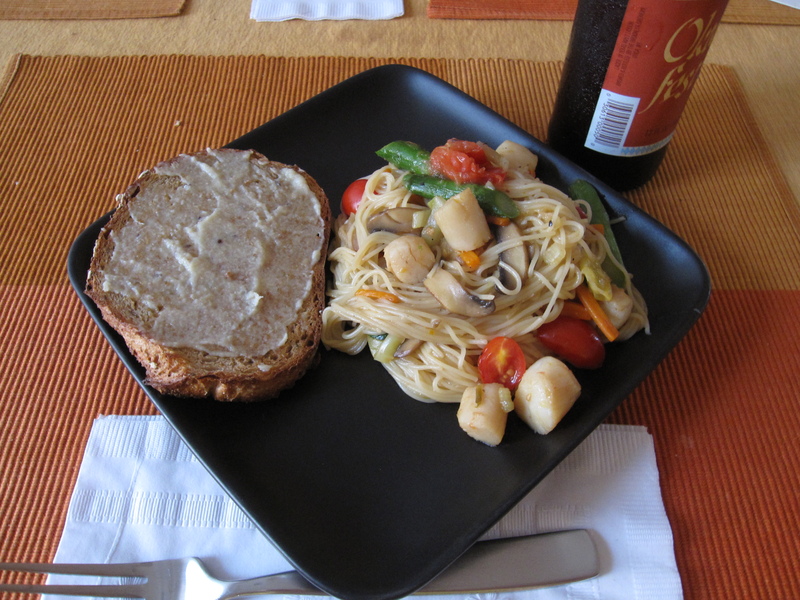 It doesn’t look like much in this picture, but last night I made some delicious pasta with scallops and vegetables. I had some things in my fridge I wanted to use up and pasta seemed like a good way to do it. While at the store I first went to the fish counter to figure out what to do. They just got in some really fresh bay scallops for $9.99 a pound, I couldn’t resist. 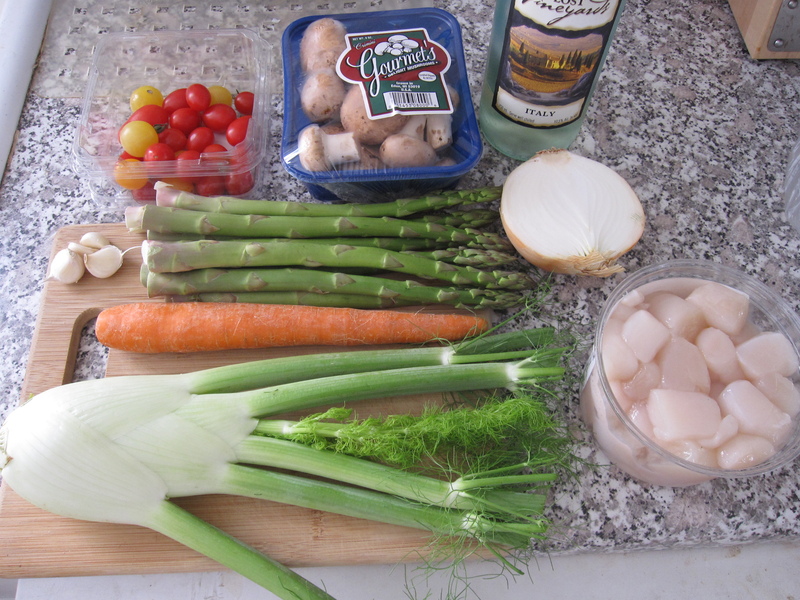 I had some cherry tomatoes to use up along with some asparagus, 3 cloves of garlic, a carrot, 1/2 onion, and 1/4 cup of white wine. To go with it I picked up a bulb of fennel (I only used half), some cremini mushrooms (I only used half the package), 1 pound of bay scallops. 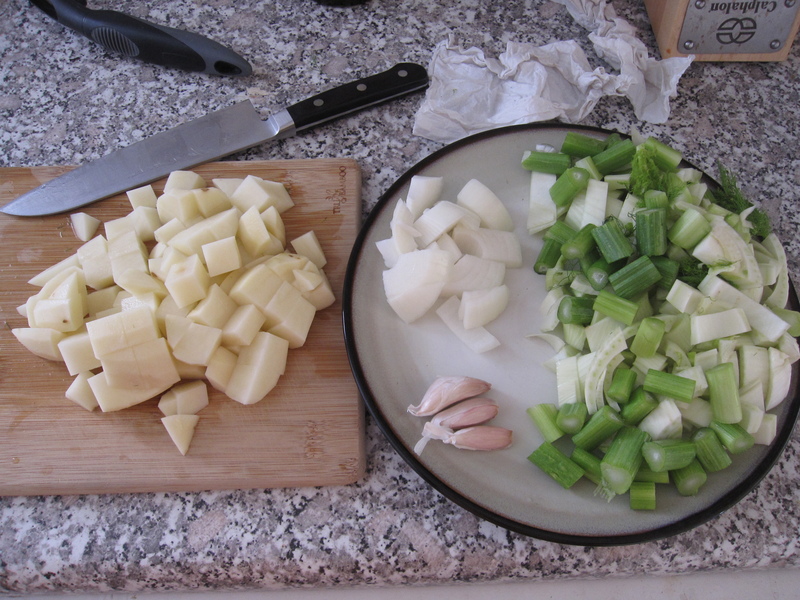 I chopped up all of the vegetables slicing the onion and fennel. In a large hot skillet I poured in a good glug of olive oil, probably about 1/4 cup or so and then tossed in the garlic for about minute. Then I added the onion, carrot, and asparagus and let them go for about 4 minutes. Then I added the fennel and mushrooms for about another 4 minutes. Once all of the vegetables were slightly transparent I poured in the white wine and let it boil off for 3 minutes while seasoning with salt and pepper. After that I added the scallops which only needed about 2-3 minutes to cook. 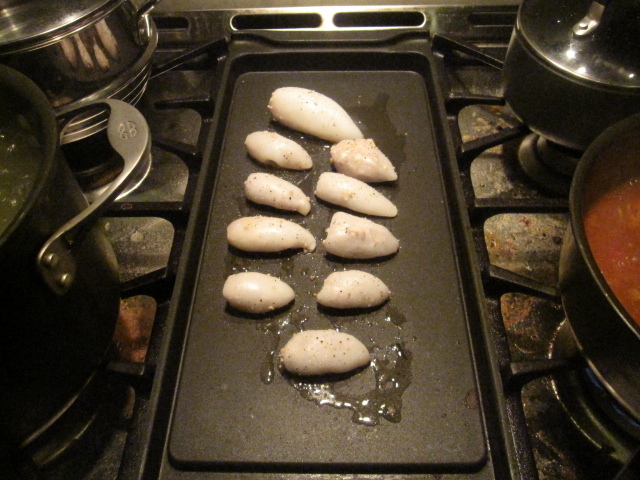 You never want to overcook scallops so always cook them a little less than you think. While this was going on I cooked some angel hair pasta according to package instructions and drained them. Once the scallops were ready I tossed the cherry tomatoes in followed by the pasta and some basil I picked from my back porch. 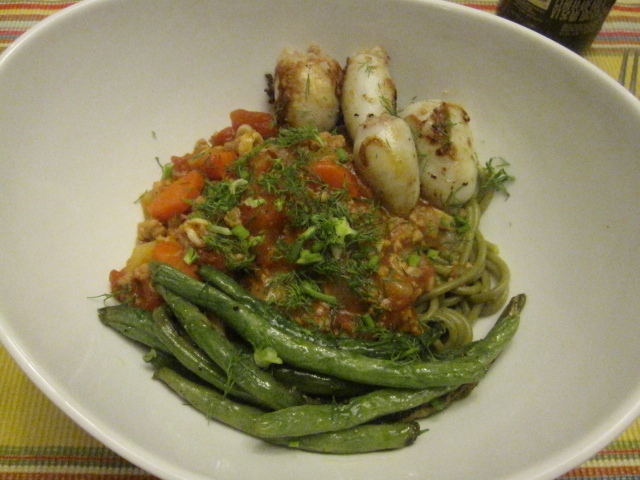 I tossed and tossed and tossed it all together so that the vegetables were incorporated throughout the pasta. Then I turned of the heat and served it up. 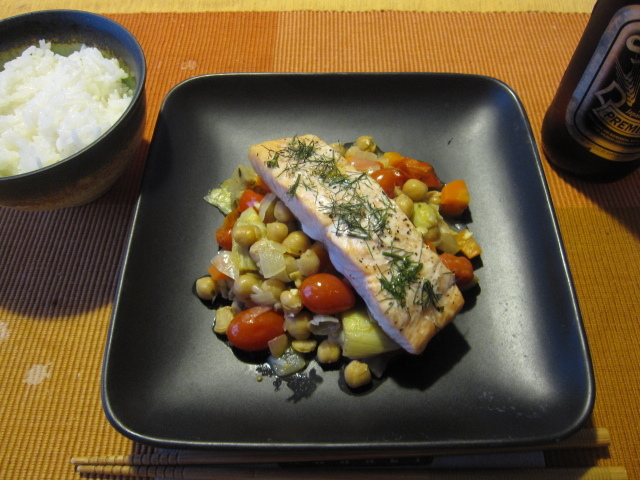 Quick, simple, healthy, and delicious. To eat with the pasta I toasted some bread and spread this delicious artichoke-garlic dip I have on top. 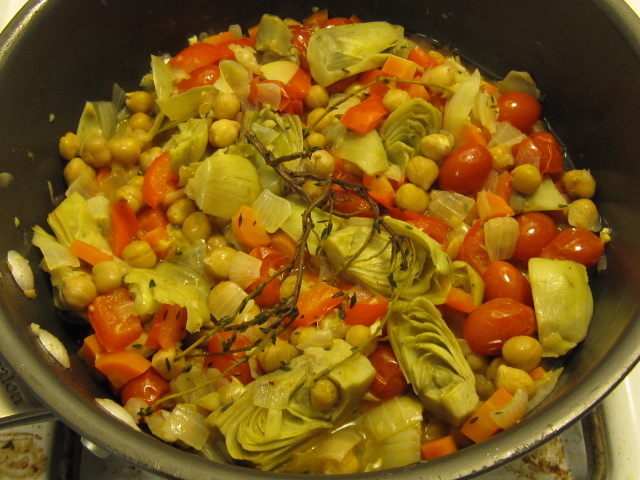 Personally, I think that fennel is one of the more underrated vegetables out there. Sure, you see it in Italian cooking. You also see its seeds in some Indian and Middle Eastern cooking. But you don’t see much of it outside of that. When I saw big, beautiful fennel bulbs at the store yesterday I just had to eat them. The first thing I did after washing the fennel was to separate the fronds from the bulbs. I took a handful of the frond and chopped them up nice and fine. I threw them into a quarter cup of olive oil along with a finely minced garlic clove, a pinch of crushed red pepper flakes, and about a half lemon’s worth of zest. 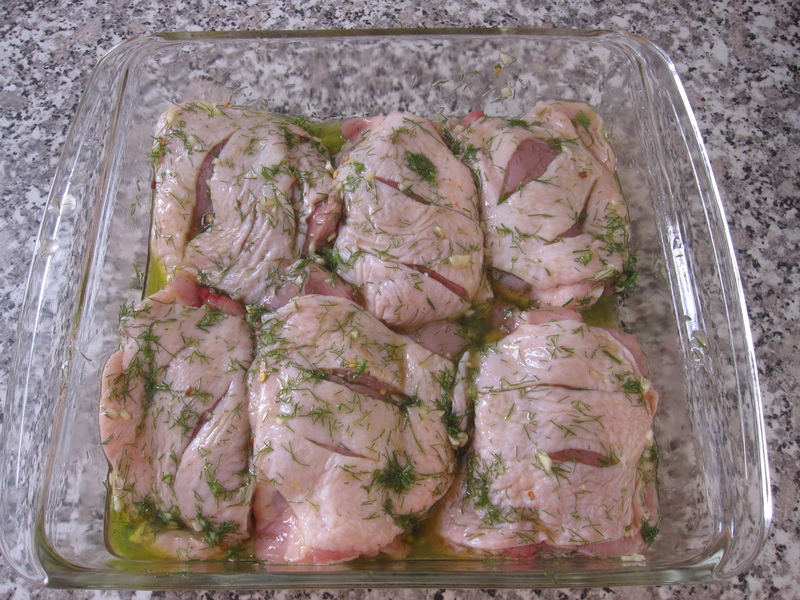 I slashed the skin on 6 bone-in skin-on chicken thighs and then coated them with the marinade. I covered it in plastic and threw it in the fridge for a couple of hours. I coarsely chopped the bulbs along with half an onion, three garlic cloves, and two medium-sized russet potatoes that I skinned. In a heated pot I melted 1 tablespoon of butter and then sautéed all of the vegetables for about 7 minutes. Then I poured in a quarter cup of white wine. 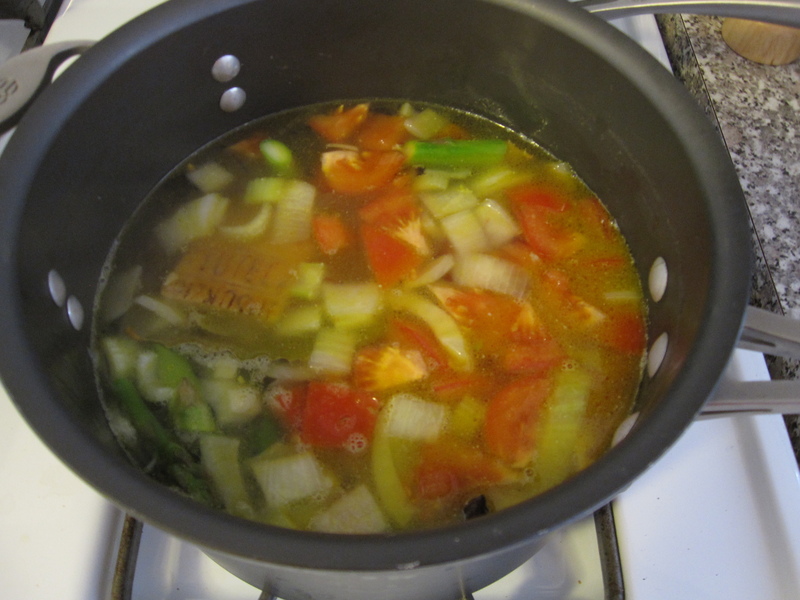 I let that boil for a few minutes and then added 1 cup of chicken stock and seasoned with salt. Once that came to a boil I covered the pan and turned the heat down to med-low. I let that simmer for about 15-20 minutes until everything was nice and tender. At that point I turned off the heat and let it cool for a bit. Once cool I poured it all into my blender along with a quarter cup of soy milk (would have used cream if I had any) and blended it to a smooth puree. 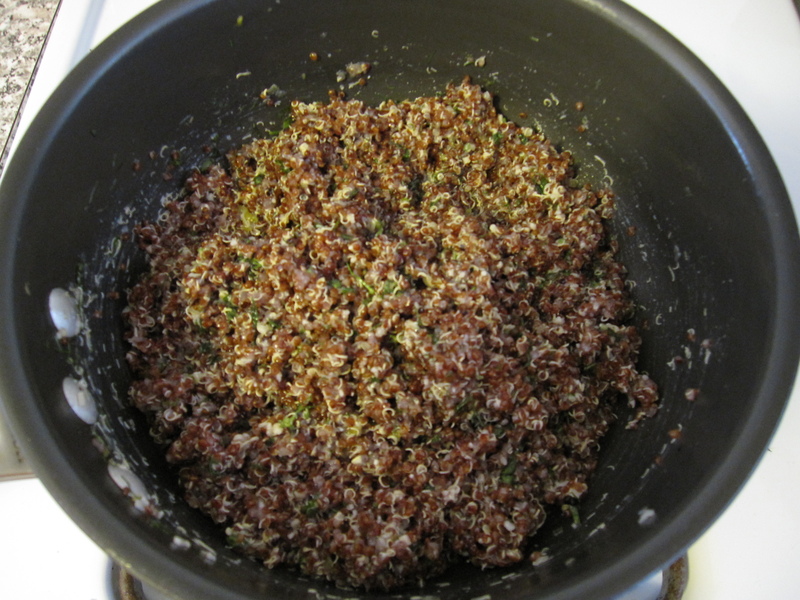 Then I poured it back into the pot, checked the salt seasoning and added some black pepper. I let it sit until everything else was ready. At that point all I had to do was re-heat it. I took some broccoli and cut it down into florets. I laid that on some foil, drizzled it with olive oil, then sprinkled zest from the other half of the lemon over it along with some salt. I took the chicken out of the fridge about a half hour before grilling to bring it to room temperature. I grilled the chicken skin-side down first to get a nice crisp skin. 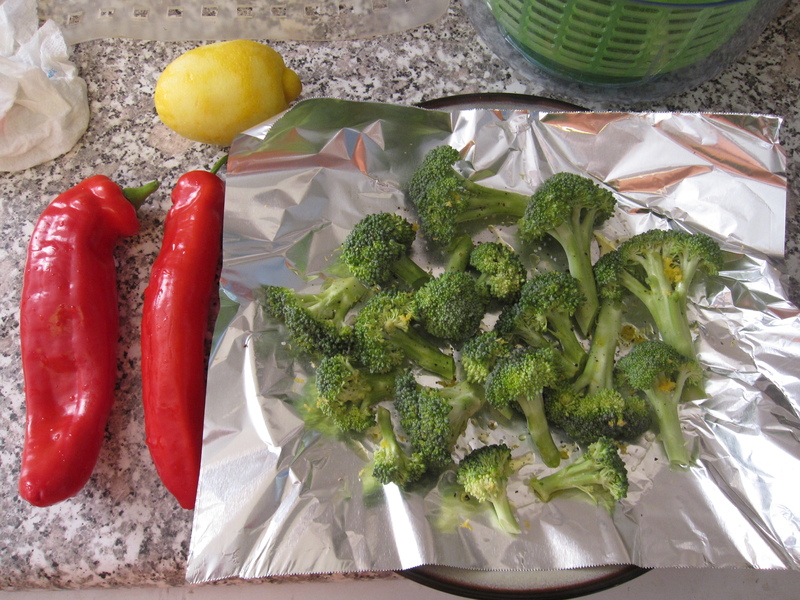 The broccoli was kept on the foil during grilling, this keeps it from falling through the grate and also keeps it from burning quickly. I also grilled a couple of big red sweet peppers. 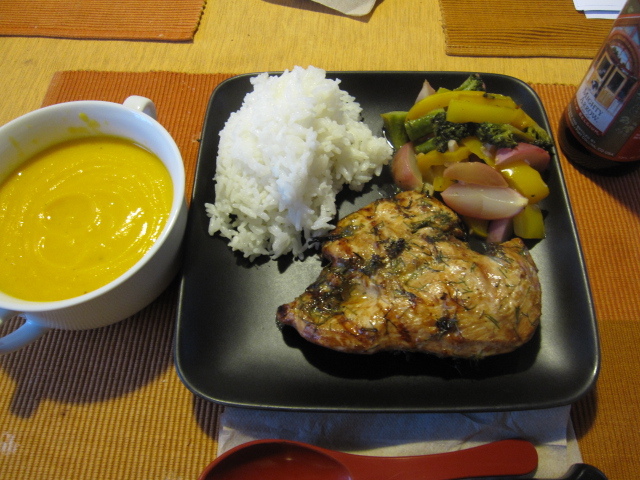 To serve, I squeezed the lemon juice on the chicken after it was taken off the grill. 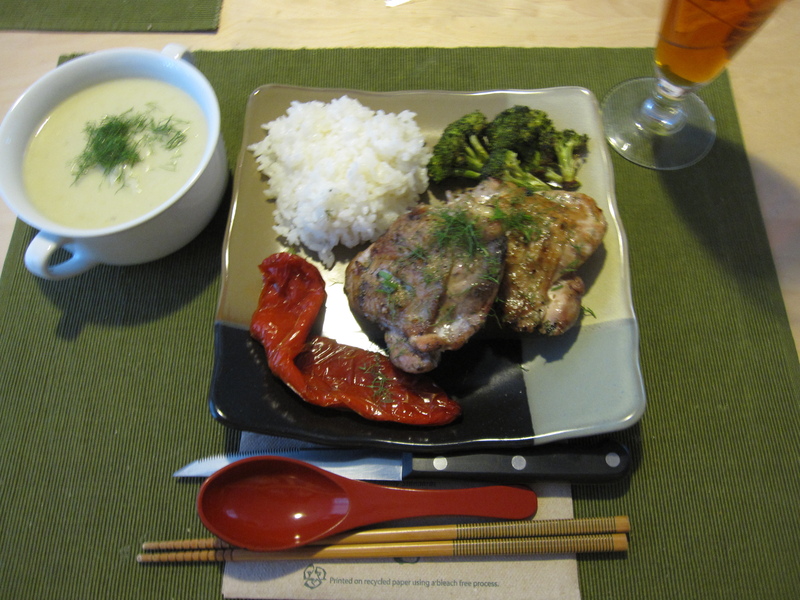 Then I garnished everything, the soup included, with some more of the fennel fronds chopped up. White rice accompanied. 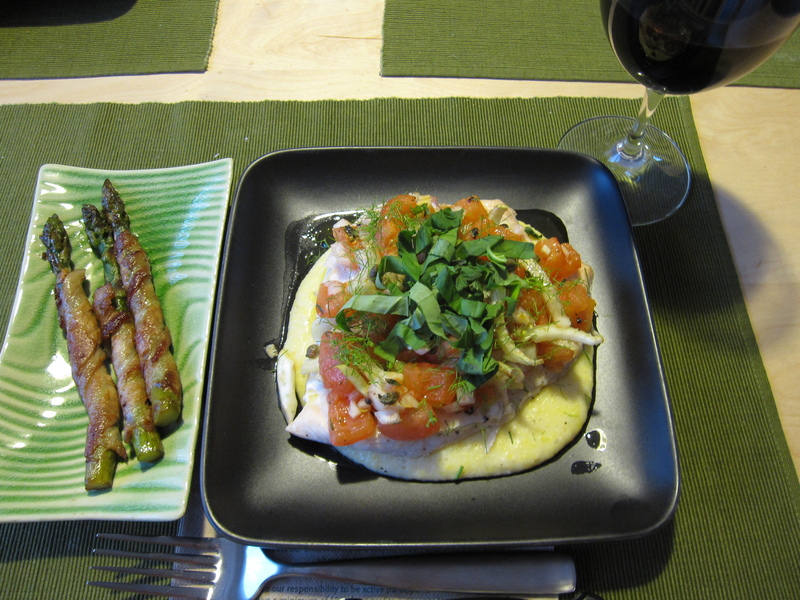 I know it’s hard to see, but there is chicken below the tomatoes and on top of the polenta. For this dish you need the chicken to be pretty thin. 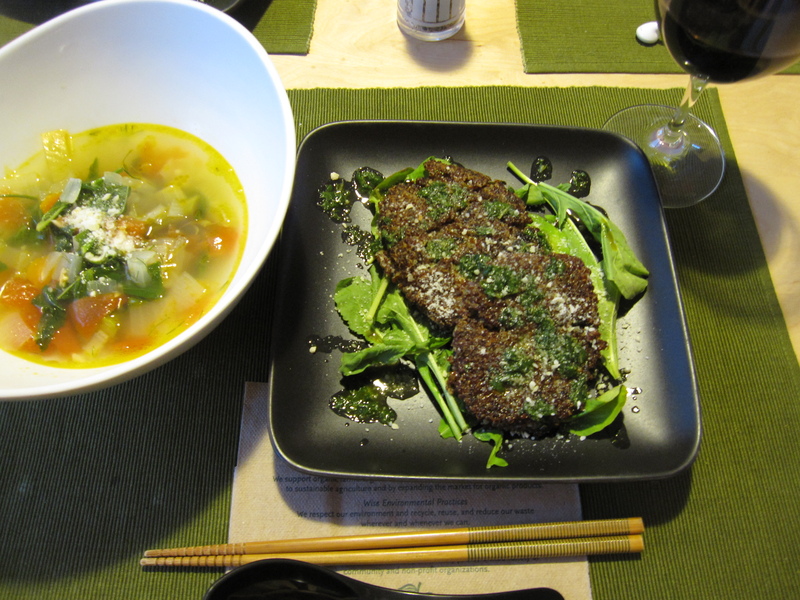 I picked up some cutlets, basically breasts that have been butterflied. I pounded them out a little in order to make the thickness a little more uniform. To do that I just put a piece at a time in between plastic wrap and pounded it with a skillet until it was the desired thickness. 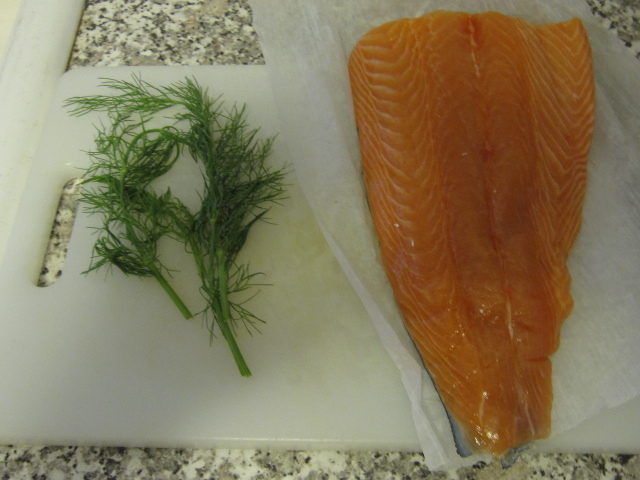 In a bowl I put in two diced shallots, two diced garlic cloves, half of a large fennel bulb thinly chopped, a tablespoon of drained capers, the leaves of 4 fresh thyme sprigs, three tomatoes that I skinned, seeded, and chopped. I poured in about a quarter cup of olive oil, seasoned with salt and pepper, and mixed everything up. 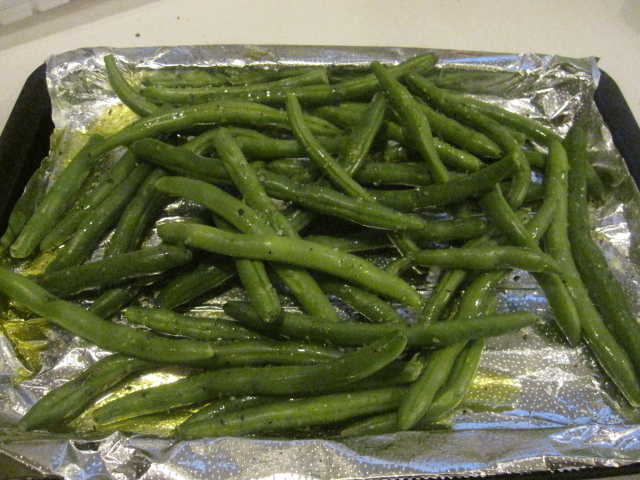 In a large baking dish I drizzled a little olive oil on the bottom, just enough to lightly coat it. I seasoned the chicken (I had four cutlets) with salt and pepper on both sides and laid them down in the dish next to each careful not to overlap any of them. 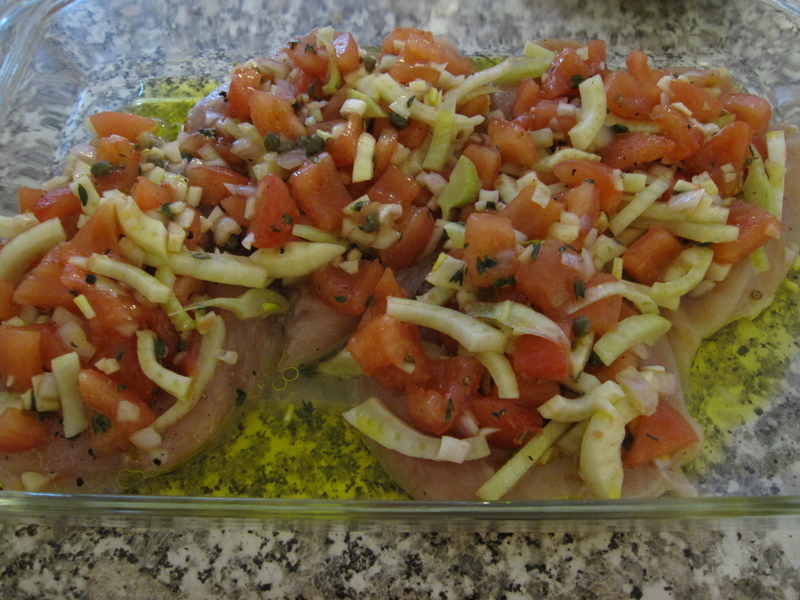 Then I spooned the mixture on top of each piece to cover the chicken completely. I drizzled a little more olive oil on top and threw it into a 450 degree oven for about 2o minutes. 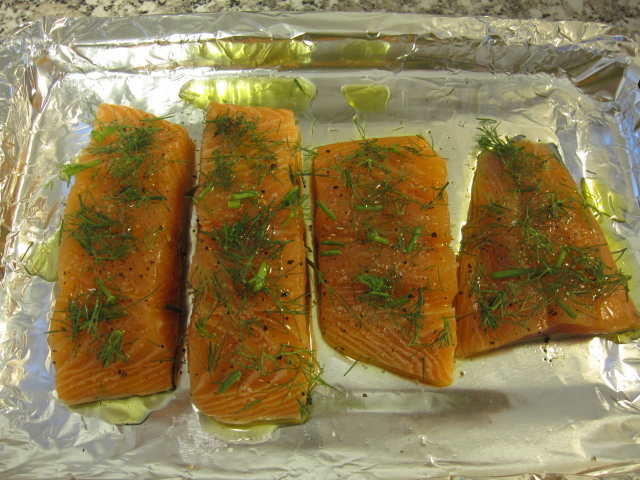 Once out of the oven I garnished with thinly sliced basil and chopped fennel fronds. While that was going on I made the polenta and some bacon-wrapped asparagus. After I skinned the tomatoes for the chicken I used the same boiling water to blanch the asparagus. After a few minutes in the boiling water I took the asparagus out and put it into a bowl of ice water to shock it. Then I wrapped them in bacon and set aside until cooking time. 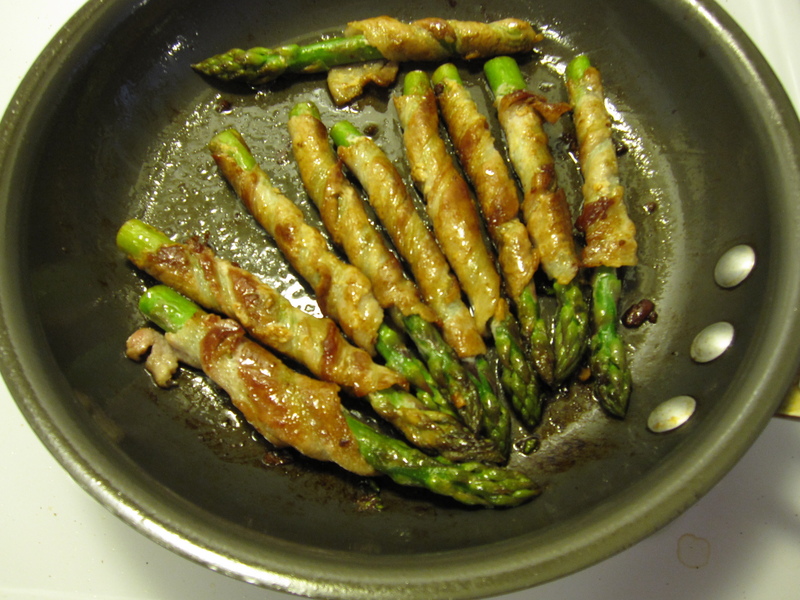 To cook them I heated up a pan and poured in just a little olive oil and then fried all of the asparagus turning to cook all sides. When the bacon was fully cooked I poured in a couple of tablespoons of balsamic vinegar and shook the pan around to coat all of the bacon. There are different ways to cook polenta. The rule of thumb that I live by is 4 cups of liquid for each cup of polenta. So, I took 2 cups of the asparagus boiling water, 1 cup of chicken stock, and one cup of soy milk. I brought it all to a boil with salt and pepper. 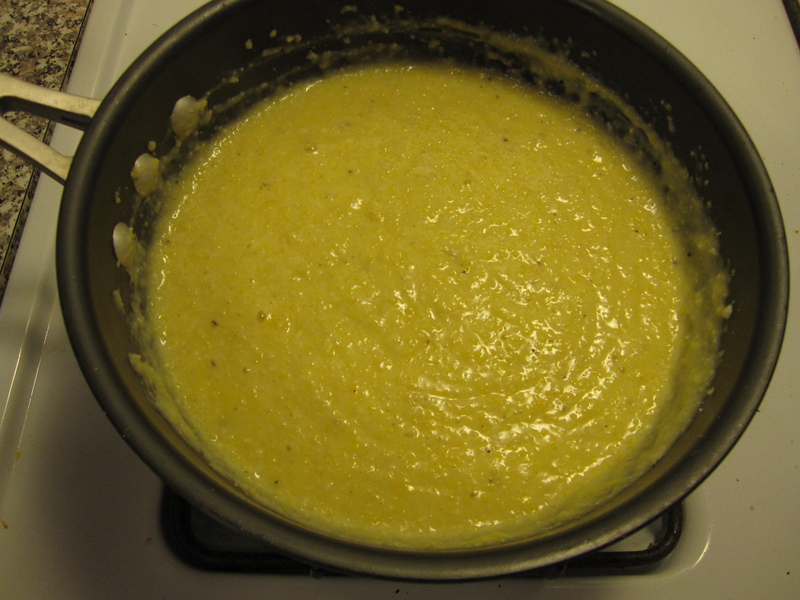 Once it was boiling, in a slow steady stream, I poured the polenta in constantly whisking. Once all of the polenta was in I continued to whisk for a few minutes. Then I turned the heat down to med-low, covered the pot, and came back to whisk every few minutes. When I got to the consistency I desired, I turned off the heat and whisked in 4 tablespoons of butter in small chunks, one chunk at a time. Then I threw in a handful of parmesan cheese and stirred that all in. That’s it. The only thing I will do differently if I make this dish again is that I’ll saute the shallots and garlic in olive oil for a few minutes before mixing them into the fennel and tomato mixture. 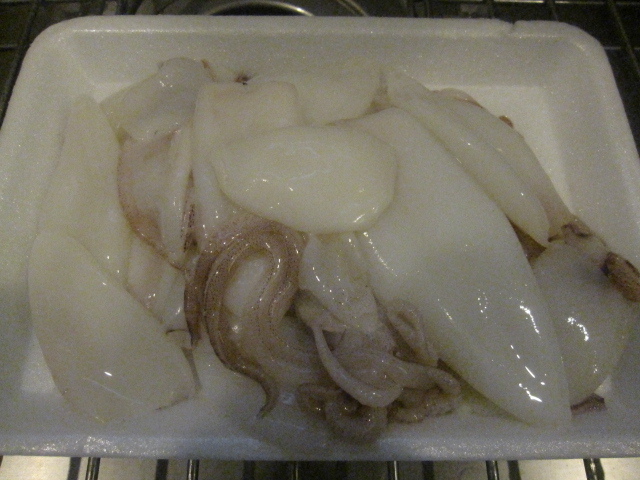 They were a bit sharp, so by cooking them a little first the sweetness will come out a little more. Otherwise this is a very simple and delicious way to have chicken. 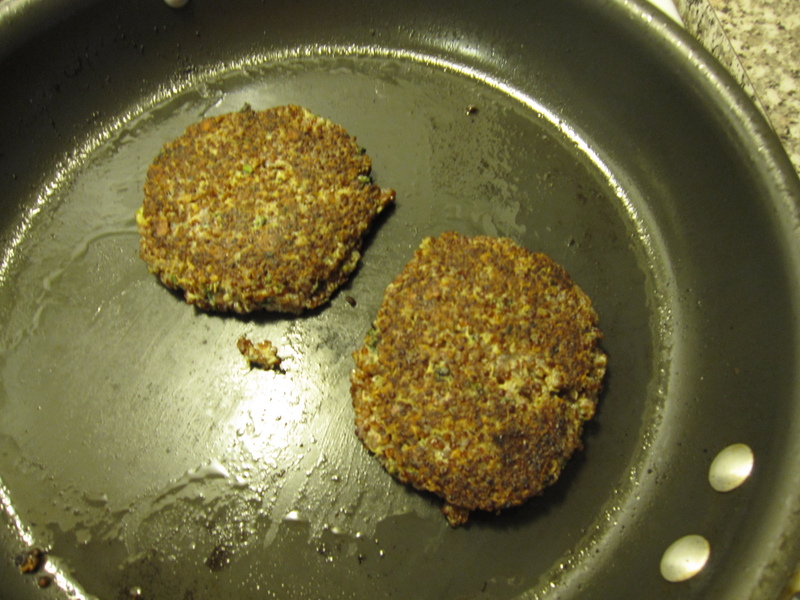 For Meatless Monday last night I made some burger patties out of quinoa. 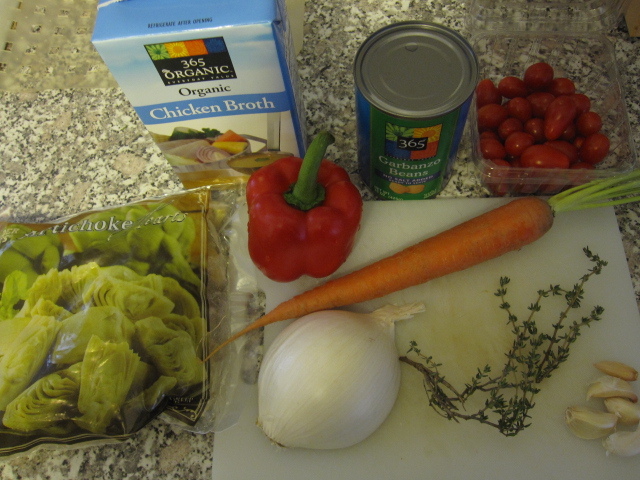 To go along with it I made a very simple vegetable soup. 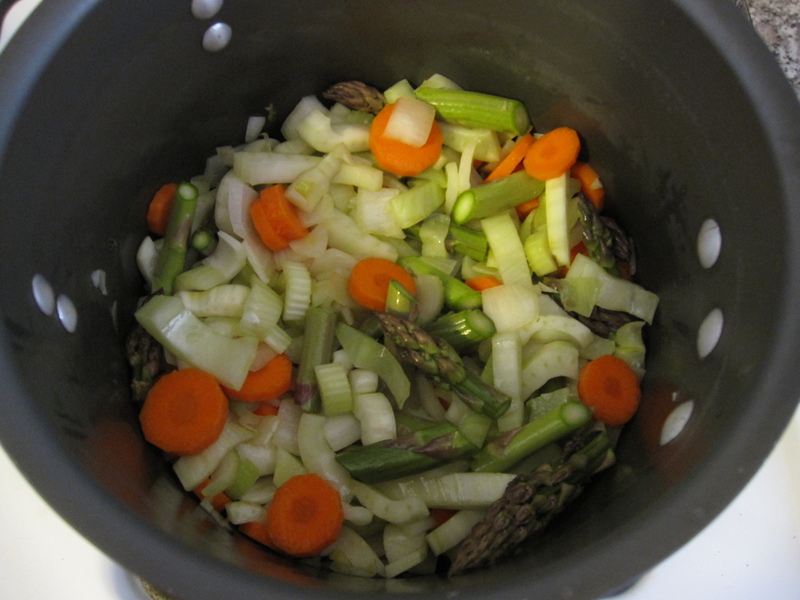 To make the soup I sautéed a half onion, a carrot, two ribs of celery, a fennel bulb, and some asparagus all chopped in some olive oil with minced garlic. I let the vegetables sweat for about 6 or 7 minutes. 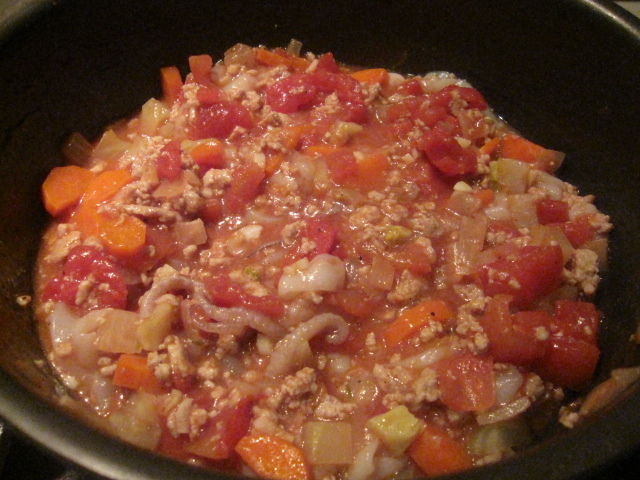 Then I added two chopped tomatoes, a few cups of boiling water, a bay leaf, and the rind from some parmigiano-reggiano. 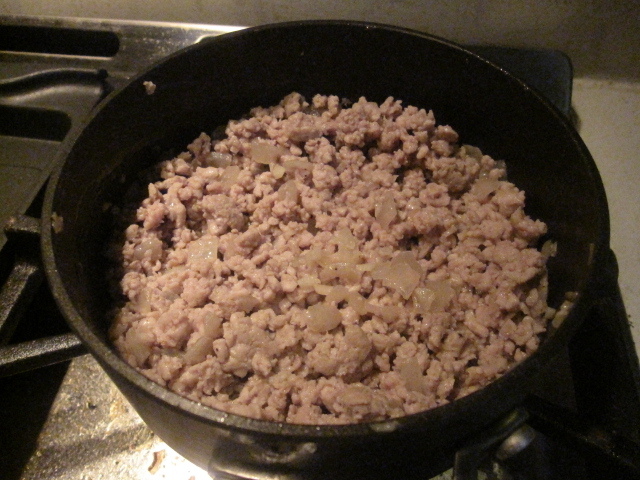 I seasoned with salt and pepper and let it simmer over low heat for a while. To make the quinoa patties I first sautéed a few thinly sliced green onions in some olive oil with a diced garlic clove. After a few minutes I added a cup of quinoa that I had rinsed a few times. 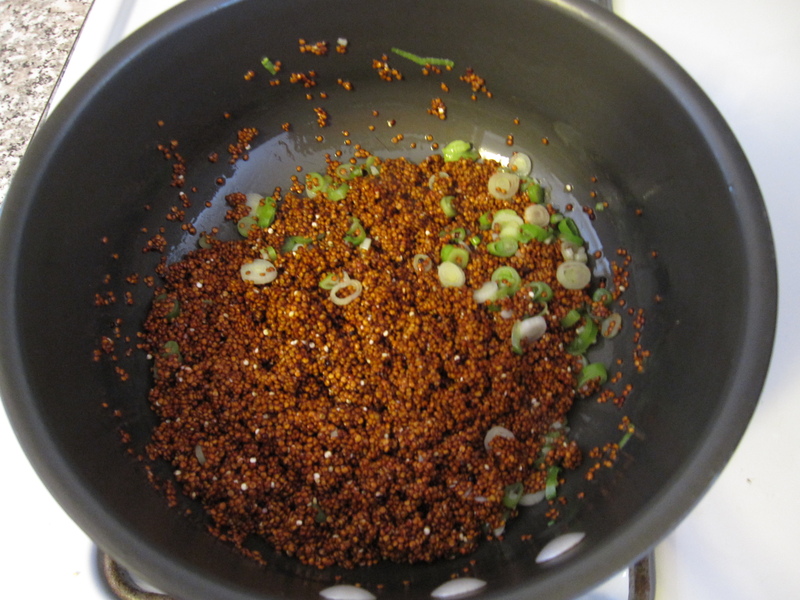 I let the quinoa cook in the oil for a few minutes and then added 1.5 cups of hot water. 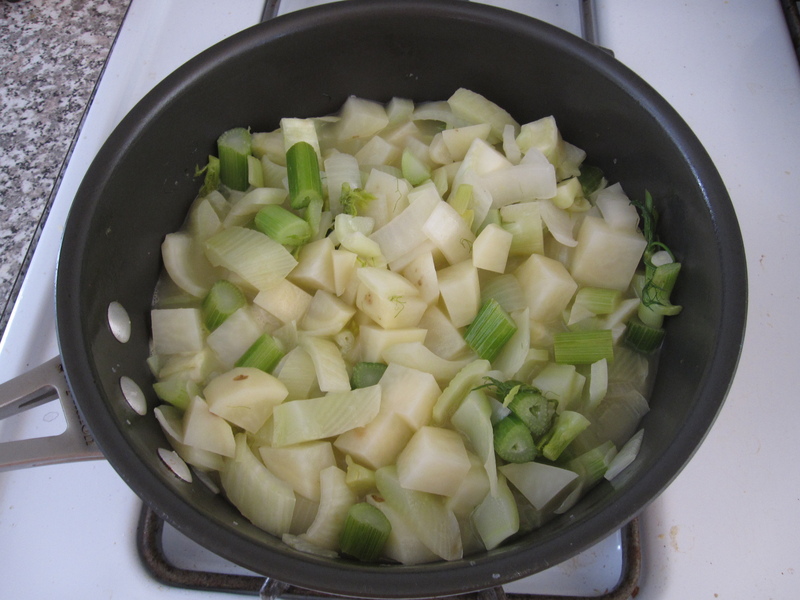 Once that came to a boil I covered the pot and let it simmer at low heat for about 15 minutes. After all the water had been absorbed I fluffed the quinoa with a fork and stirred in some grated parmesan, a handful of thinly sliced basil, salt, and pepper. Then I let it cool down for a bit. 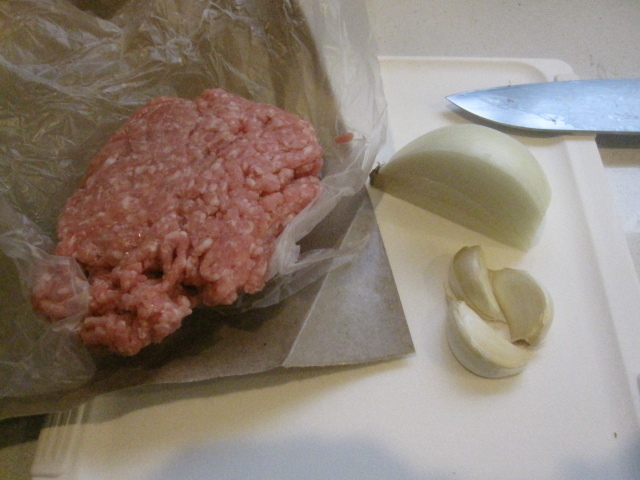 After it had cooled, I stirred in one egg and formed 8 patties. 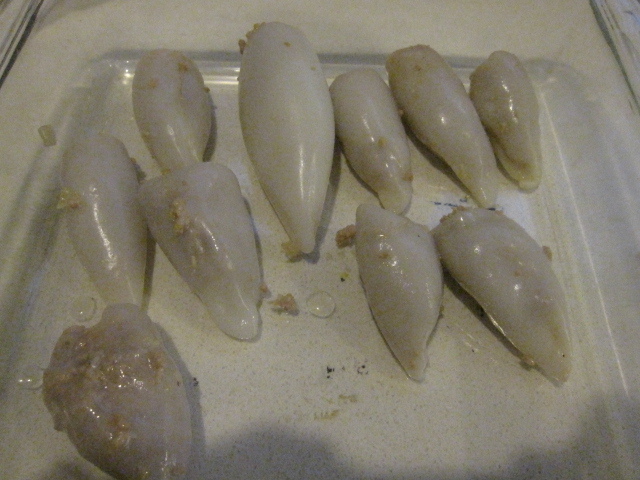 I put them in the fridge for about 15 minutes to firm them up a bit. In batches, I fried them over high heat in butter. I added a little butter as need be. To serve, I laid a couple of patties on top of baby arugula. I made a simple sauce of basil, olive oil, balsamic vinegar, salt, and pepper in my small processor. I drizzled the sauce on top and then tossed some parmesan on top of that. It turned out delicious, but the patties were very fragile. If I make them again I’m going to add some bread crumbs. I think that will help keep the patties firm and less prone to falling apart. But the flavors were great.